For whatever reason, it has since faded into twilight, and is today even less mentioned than read. Still, the good news is that Peake’s world has exquisite staying power. Indeed, it is timeless. For a willing reader, it retains the transformative power that defines a classic. Some of the difficulty in evaluating or even describing a title like Titus Groan is that it twists away from expectation and defies comparison in almost every category. However, I can say with confidence that you’re primed for this adventure if you found yourself delighted by Susanna Clarke’s recent bestseller Jonathan Strange & Mr. Norrell. Also, if a story’s ability to grab you doesn’t require a chain of popcorn-crunching fight scenes or a crow-straight narrative. Maybe you’re an admirer of dense, imaginative details that lend reality and solidity to worlds that never existed. Possibly you’ve always been a fan of the dark humor of cautionary tales, the absurd and macabre imaginings of Poe, Gorey, Dickens, Heinrich Hoffman, or even Tim Burton. It may be because Peake was also an illustrator and poet as well as an author for children that Titus Groan reflects some of those sensibilities, yet it is a brilliant thing unlike any other. Titus Groan is born to become the seventy-seventh Earl of Gormenghast, a strange geography where mountain simultaneously intersects desert and pine forest, where mud huts and cacti sprawl at the feet of a massive Gothic castle. It is a place of implacable traditions such as June’s judging of the carvings. The brutal lives of the Dwellers beyond the castle ravage their youth by twenty, but their uncommon if short-lived radiance is echoed by their artists’ fantastic and colorful wooden sculptures. Every year, the Dwellers’ three finest works are selected by the Earl, and the rest are incinerated. Within the castle’s walls, the annually accretive Hall of the Bright Carvings is ignored by everyone but Rottcodd, who tends the figures though not the dust-blanketed floors, and dozes away his hermetic life. In contrast, nonagenarian Sourdust’s vocation isn’t maintaining a single tradition, but the entire Groan lore of rituals, as perverse and poignant as they are inviolable. It is against the gorgeous textural complexities and contradictions of Gormenghast that even minute changes become highly-charged, dramatic events. However, while Peake’s characters may bear grotesqueries of physique and behavior along with names like Flay, Nannie Slagg, Dr. Prunesquallor, and Lord Sepulchrave, they resist falling into caricature. Each person is elaborated with conflicting emotions and relationships, and the descriptions aren’t formulaic or detached. On the contrary, each portrait is unique, immersive, and sensual. You can match your impressions with Peake’s selected sketches. Each character’s nature is richly manifested in flesh. A synopsis of the major story elements might sound like a string of trivialities considering 21st century sensibilities. The glory of Titus Groan is that from within its pages, they won’t seem that way at all. Its atmosphere is so seductive, small events and moments become deeply evocative as they quake and rupture the coagulated existences within this mapless realm. It’s true that Titus Alone, the last of the trilogy, reads differently from the first two books. Some readers explain this as Peake’s artistic intent, some accept it as a byproduct of the onset of Parkinson’s disease, and some simply declare it unforgivable. 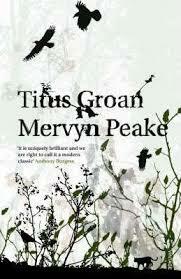 For me, the totality of Gormenghast is a panoramic feast, undimmed by a few, less luscious courses. However, if you’ve invested yourself in experiencing Gormenghast with even fraction of the attention and love Peake must’ve spent crafting it, your opinion on the matter may be many things, but never impersonal. Gormenghast has already changed you. One of the attractions of reading fantasy is what Fuchsia, Titus’ teenaged sister, seeks from art: “something unexpected…something quite fresh and new. Something she had never thought of before.” If your desire is to slip the bonds of your everyday, to read a work capable of inspiring and transporting you, to baptize yourself in an original creation, Titus Groan awaits.